The B.S. degree in geology focuses on scientific study of Earth; common rocks and minerals, processes that form and alter basic Earth materials, and key events in the geologic evolution of the planet. Specifically, the B.S. in geology is designed for students intending to pursue advanced studies in geology or who intend to pursue licensure as a professional geologist. Because geology continues to become more integrative, technical and global in its approach, the B.S. 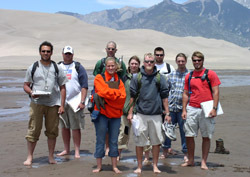 in geology program encourages students to develop basic proficiencies in mathematics, chemistry, and physics in addition to effective oral and written communication skills including computer literacy.